I have been an avid collector of autographs since 1992. 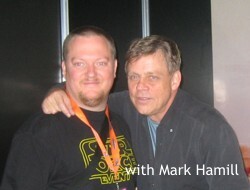 It all started with a Star Wars convention in Germany (Jedi-Con) where I met Dave Prowse and Anthony Daniels. Soon the autograph bug caught me and I became seriously involved in collecting Star Wars autographs. 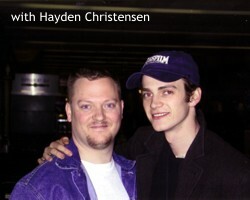 I have met with more than 150 cast- and crewmembers, including Mark Hamill (Luke Skywalker) and Hayden Christensen (Anakin Skywalker). After more than ten years, my collection has become one of the most prominent and important autograph collections in the world. It is by far the largest in Europe. Many other collectors use my website as an index for authenticity purposes and compare their items to mine to make sure they have obtained the real deal. In 2000, a whole new realm of autographs peaked my interest, when the Lord of the Rings Trilogy was released in cinemas worldwide. Soon I would also be collecting items from Orcs and Elves alike, creating yet another fancy collection. Again I traveled the world to obtain numerous autographs in person, thus obtaining one of the smartest looking autographed posters around. Since then, I have also been visiting other shows and even organizing (or co-organizing) signings myself, where I have met or worked with numerous stars from other shows and movies. That was the start of a whole new chapter in my autograph collecting days. Before I realized, I had started no less than 6 new collections: Battlestar Galactica, Alien, Indiana Jones, The Matrix, Superman and Kill Bill. While these collections are rather small and thus a far cry from the Star Wars collection (which remains my main focus), they are nice enough to have been published.